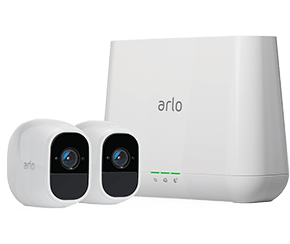 The Arlo Pro 2 Smart Security system comes with two cameras. 1080p HD lets you see everything that goes on at home in more brilliant detail than ever before. Arlo Pro 2 has the flexibility to go wire-free thanks to its rechargeable battery, or stay plugged into power. When plugged in to an indoor power outlet, you unlock your security camera’s advanced features, like Activity Zones and optional 24/7 Continuous Video Recording. The IP65-certified Arlo Pro 2 is weather-resistant to stand watch for you from anywhere. Indoors or out, rain or shine. *Device requires a $10 data device fee. 2-Year Promo Price requires a 2-year contract.